Does the Hurricane Spin Mop Live Really Clean, Dry, and Polish Floors? Does the Hurricane Spin Mop Really Work? The Hurricane Spin Mop says that it can clean, dry, and polish your floors all at once, and without the need for you to get down on your hands and knees. They also say it’s environmentally friendly. But how well does it really work when you get it home? Companies are always coming out with ways to clean up your home more easily, and to do a better job of it at the same time. It’s a matter of figuring out which ones will do the best job for you and your home. A product has to be reliable, and it has to do a good job, or else it’s just a waste of time and will not leave you with a truly clean home. The makers of the Hurricane Spin Mop claim that it picks up hair, dirt, and dust so that you don’t have to sweep up the floor before you mop. This would save you a step and allow you to finish more quickly. They also say that the material it uses can hold up to ten times its own weight, so you won’t have to keep wringing it out. When it does soak up too much water, it’s easy enough to dry it out, and that’s where the “spin” comes in. You put the mop in its accompanying bucket, press down on the foot pedal and it rotates so that the mop head spins out all of the water it contains. This is far more preferable than trying to wring a mop out, which can be a messy job, requiring a lot of effort and struggle. This comes with its own infomercial that successfully shows off all of its features, and makes it look like a great cleaning product to add to your arsenal. You probably didn’t give a lot of thought to your mop or your floors, but after seeing the promo video for this it becomes a high priority and you don’t really want to go back to your old way of doing things. 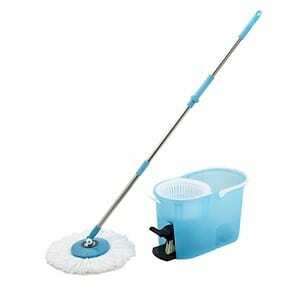 The total cost for the Hurricane Spin Mop is $53, which they break up into two payments. The first payment comes to $33 and includes a $13 shipping fee. The next payment is made a month later for $20. For a mop this seems rather pricey, and it’s hard to find competing mops at this price point. They do have a deal going where you get $15 off another As Seen on TV product, but it would be nice if they could get the price down on this one. This would definitely represent a reduction in your commitment levels, as it saves you from sweeping, and also from the drudgery of wringing out a dirty mop. It also let’s you simply start mopping without having to sweep first. Many people have bought into the Swiffer WetJet and other similar products, but they don’t seem to do a very thorough job, and can be a pain since you have to continually replace the used up pads. The reviews for the Hurricane Spin Mop have been mostly positive, and this seems to be a product that delivers on its promises. When you consider that the mop head pops off and can be tossed in the washing machine up to 300 times, there is a cost savings in the long run over using sweepers that require you to buy replacement disposable pads. It’s using microfiber materials, which have been shown to be very effective at picking up larger amounts of water than conventional mop material. Most of us have the unpleasant experience of getting up close and personal with a dirty, used mop, which is never fun and is a main reason why this product has enjoyed so much success. It’s easy to see that with the bucket it comes with you’re distancing yourself from the mess, and you never have to touch anything that’s dirty or gross. This means you can clean up messes that would otherwise be pretty nasty, without having to get to involved in the process. For that reason alone this is a good product to pick up. We’re giving the Thumbs Up rating to the Hurricane Spin Mop, based on its innovative design, and the fact that it’s performing well in real world situations. Also, it makes up for its higher upfront cost by being washable and reusable, so you won’t be continually buying a new mop head when it gets dirty. It’s good to have a lot of tools in your toolkit when it comes to keeping your house clean. With a product like this you may find that you’re able to keep up better with the floors, and it doesn’t have to seem like a huge chore. For families with a lot of foot traffic, this is almost a necessity. What do you think? Does the Hurricane Spin Mop work or not? I never believed in all in one type of products until I bought my first roomba, boy that thing works like magic when I’m not around the house LOL. Hurricane spin Mop looks pretty good too. I don’t know about the spinning motion helping with the cleaning so much, but I do love the spinner bucket design for easy washing of the mop. I have a feeling that I’m going to like this as much as I like my roomba.